History is memory, the past is memory. When you come down to it, everything is memory." "Romantic love is mental illness. But it's a pleasurable one. It's a drug. It distorts reality, and that's the point of it. It would be impossible to fall in love with someone that you really saw." At 102 years old, Portuguese auteur Manoel de Oliveira is the oldest director still active within the industry. His enviable body of work consists of over fifty directorial credits alone, spanning seven decades (the majority of which were made from 1972 onward). Beginning with the documentary short Douro, Faina Fluvial/Labour on the Douro River in 1931, right through to the upcoming A Igreja do Diabo/The Church of the Devil, which is due for release later in the year. Filmmaking is an art, and an uncertain one at that. Lead as much by the hand of fate as creative talent and ambition, directors much younger in years have either already stepped back from working life, hit their creative peak or simply run out of stories to tell. From that perspective, you could be forgiven for thinking that De Oliveira, who has already given so much to cinema, may come to the same fork in the road. Fortunately for us, and the man himself, this is definitely not the case. Premiered at the Berlin Film Festival in 2009, Singularidades de uma Rapariga Loura / Eccentricities of a Blonde-Haired Girl shows the director on fine form. This film bears the mark of a man who is still very much in love with the medium, and what we see on screen exudes as much verve as it does skill. With a runtime of just 64 minutes, in comparison to his earlier works, such as 1985's Le soulier de satin/The Satin Slipper (clocking in at a majestic 410 minutes) or 1993's Vale Abraão/Abraham Valley (a speedier affair of 187 minutes), Eccentricities is a short film, and indeed, if it were made by anyone other than De Oliveira, it's probable that it would be considered in such terms, but don't let that put you off. Short it may be, but throwaway it's not. The scope of the story may feel small, but there's an enviable and level of luxury in the way that it's told. Adapted by De Oliveira from the short story of the same name by celebrated realist writer Eça de Queiroz (featured in the collection O Mandarim/O Mandarin published in 1880), Eccentricities dispenses with the original 19th century setting, and relocates Querioz's wistful tale to the present day. 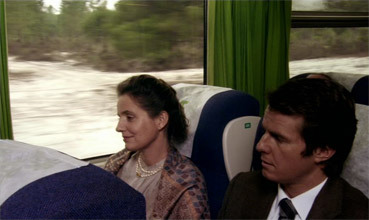 Macário (Ricardo Trêpa, equal parts Byronic brooding and Austenesque restraint), a young man travelling to the Algarve aboard a train strikes up a conversation with the woman (Leonor Silveira) in the seat next to him. Throughout the course of the journey, he shares the story of his tumultuous relationship with a beautiful, mysterious blonde named Luisa (Catarina Wallenstein, just as alluring and beguiling as Dickens' famed object of affection, Estella Havisham). At first, he admires her from afar, across the street from the window of his Uncle Francisco's (Diogo Dória) shop, where he works as an accountant. When the two finally meet and fall in love, Macário seeks his uncle's blessing to allow them to be married. Instead of warm congratulations, he's met with resistance and disapproval. Cut off by his uncle without a home or any form of income, Macário leaves Lisbon and Luisa behind for Cape Verde in the hope of building up savings so he can support them both. When he returns sometime later, with money and business contacts accrued, he believes he can finally win his uncle's approval and marry the girl he loves, but his trials aren't over. 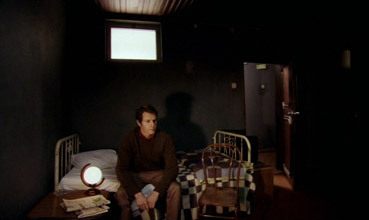 The film marks De Oliveira's first foray using realist material, and required a change in approach in regard to both editing and tracking. Despite Eccentricities' brevity, its representation of time, both in narrative events and setting is curious. Of course, this is partly representative of the fallible nature of memory and how we absorb detail – we see everything through Macário's eyes. Tracking shots are slow and graceful and static ones are held to the point you can soak in the very being of the story Macário is relating (though at times, it is easy to let your mind wander and lose focus), and genuinely revel in the metticulously composed tableaus De Oliviera has created. There's a playfulness and dare I say showy aspect to the film; a confidence and a decadence in his refusal to cut and chop away at the narrative where it's not necessary. Qualities such as these, can only be demonstrated by a man with years of experience behind him. However, for all the luxury and decorousness reflected in the film's style, the romance at the heart of this film is the epitome of restraint. Perhaps in ode to the source material, the tone of Eccentricities feels partcularly 19th century. Macário and Luisa's romance is more like a classical courtship (much of which is unseen) built upon politeness and propriety. Instead of approaching Luisa on his own, Macário asks for a formal introduction, which eventually happens when he attends a party hosted by an influential notary, where they listen to recitals of music and poetry before playing parlour games. Even Macário's drive to support Luisa financially reads like he's offering her a dowry, rather than attempting to be her financial equal (though never explicitly stated, Luisa's family appears to be wealthy). Appropriately for a story that is ostensibly about recollection of the past, Eccentricities also refuses to be modern in its aesthetic. The director's filmic worlds have always been heavily symbolic, and Eccentricities is no different.There are further echoes of heritage cinema and there's something almost museum-like about the presentation of interiors, particularly in the homes of Uncle Francisco and Luisa's grandmother (which are starkly contrasted with the cramped office Macário works in and the sparsely decorated room he rents after being ousted from Francisco's). This feeling is so pervasive that when we see Macário's uncle use an electric shaver while the pair talk, it looks positively anachronous. Whether by accident or design, De Oliveira's film is hard to define in terms of period making it exist both in and out of time, lending the film a vague almost otherworldly air that is somewhat at odds with its realist foundations. In many ways, Eccentricities is a minature calling-card for all that is De Oliveira, distilled to the point of being elemental. Watching this film is like an old friend telling a good story exceptionally well. Full of nostaglia and bittersweet poignancy, on one level, this is the story of a young man reflecting upon the love of a woman he adores. On another, it's also about a wiser man, one called Manoel de Oliveira, reflecting upon his considerable achievements, and love of another kind: for cinema itself. An attractively clean and detailed 1.66:1 anamorphic transfer whose contrast is punchy without feeling too strong (that said, some detail is occasionally lost to the deep blacks) and whose earthy, almost golden colour palette intermittently allows hues of other persuasions to break through. Grain is visible but in no way distracting, and there are no obvious signs of edge enhancement. Perhaps unsurprisingly, the Dolby 5.1 surround track is livelier and fuller than its Dolby 2.0 stereo equivalent. With no score to speak of it's down to Ana Paula Miranda's harp performance, the appreciative appluase, and ambient sound such as background traffic to show this off. A barebones release, with optional subtitles and 5.1 audio, but with De Oliveira 's name on the cover, it rather sells itself. For those curious to learn more about the director's creative process, an interview with the director can be found within the press kit for the film. Click here to read it. Eccentricities of a Blonde-haired Girl is a beautifully composed and elegant film. 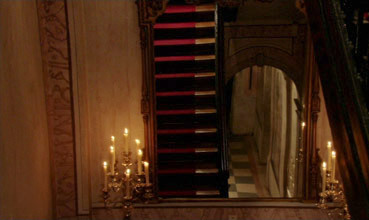 Though it ranks as one of the shortest films in Manoel de Oliveira's impressive body of work, this wistful romantic tale highlights why he's become so revered. For some, the director's approach to pace will leave them frustrated, but for others, the opportunity to revel in looking at the world he's so meticulously crafted will be a nothing but a pleasure. Warmly recommended.